Hand Over Heart: A Story of…Freedom? I’m going to chalk this one up to homeschooling: independence, individuality, bravery, fortitude, and class. Go, Gabby! A couple days ago it became national news when American gymnast Gabby Douglas neglected to put her hand over her heart for the national anthem. More accurately, it was national news that social media blew up with outrage over this omission. Well, yeah! How dare a national representative not fall in lock-step with the mandated national liturgy! How dare she act like an individual! How dare she swim upstream! How dare she have independent thoughts or actions! How dare she not bleat with the herd! How dare she act like she’s . . . free! I’m mean think about it. It’s one thing to sing “land of the free,” but it’s a whole different thing to act like it! We’re not supposed to do it, actually. I mean, yes, we preach good ol’ American independence, but we really demand collective conformity. It’s especially bad when an icon, an athlete, a representative star breaks ranks with the fascism that lies beneath the façade of freedom. That just might influence the children! 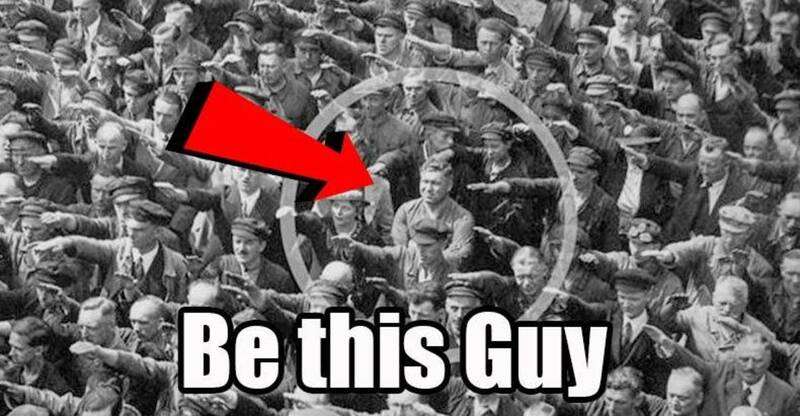 The whole blow-up reminds me of the famous pic of August Landmasser—better known to perpetuity as “that guy who refused to salute,” or, the guy from the “be this guy” meme. Yeah, Mr. Landmesser was expected to fall in line with national liturgy. He was expected to give the Nazi salute in his homeland. But he had fallen in love with a Jewess. Love does strange things to people. In this case, it opened his eyes to the evils of National Socialistic racism. For his independence and bravery, he was rewarded with prison, and then military conscription—which proved fatal. Folks, here’s the lesson: nationalistic collectivism = bad; individual liberty = good. Go and do thou likewise. Class dismissed. Looking back we can see the evils that consumed a whole nation, and we can easily condemn them. We can also easily support those who resisted the tide, and we can even let our imaginations run wild thinking we’d be like that guy, too. But you see it ain’t so easy to do. It’s easy to condemn the nationalism of a by-gone era. It’s much harder to admit we have our own. The national outrage over one person merely neglecting to put hand-over-heart during the national anthem ought to be startling evidence to you. My suspicion is that every American who’s anger swelled in-breast at this great affront immediately began judgment. She’s black. Probably a leftist already and consumed with #BLM entitlement mentality. She’s probably a Muslim and hates America. No. She’s a Christian, she’s homeschooled, and her parents taught her to work hard and achieve. And she did it. And when she won her first gold medal in 2012, the first thing she did was give glory to God. Would that the knee-jerk critics from the herd would learn more self-discipline. Not to mention history. There is ample reason Christians should avoid the automatic “hand-over-heart” mentality. I suspect Gabby’s reason may not have been ideological. She was simply standing respectfully and just neglected the nationalistic pose. I could be wrong. If so, she is perfectly warranted in exercising her freedom according to Christian conscience. Poor girl has, in fact, probably never experienced the collectively-enforced ritual of a class mandated to place hand over heart and recite a national pledge or anthem. And good for her, and her parents. We need more of these. She did issue an apology—but only generally for offending some people and with an assurance she meant no disrespect. She did not explicitly acknowledge it as wrong not to “salute the flag” by placing her hand in a certain gesture—and I say good for her, she should stand firm at that position. If we are to salute anything, it is to be God’s name alone (Deut. 6:13; 10:20). No Christian needs to feel cajoled by any peer pressure otherwise. Stand firm and let no man intimidate you with idols. What in the world is America all about, after all? Are we free and brave like we sing? Do we really believe it? Practice what you preach, Christian. Be brave. Be free. Back off. Act like free Christians who respect freedom. Quit acting like Nazis. Don’t hide your Christian heart under the bushel of nationalism. Joel McDurmon, Ph.D., is president of American Vision and has authored over a dozen books including: Restoring America One County at a Time; The Bible & War in America; Biblical Logic in Theory and Practice; God versus Socialism; The Return of the Village Atheist; and Jesus v. Jerusalem. Dr. McDurmon is also featured in several audio and video lectures on various topics of economics, apologetics, and church history. He has served with American Vision since 2008. Joel and his wife have four sons and one daughter. Does God Require Christian Education?